It’s a beautiful afternoon in the Caucasus Mountains. It’s July 5th. The team went to Pashtukov rocks. The height of Pashtukov is 15,400 feet above sea level. 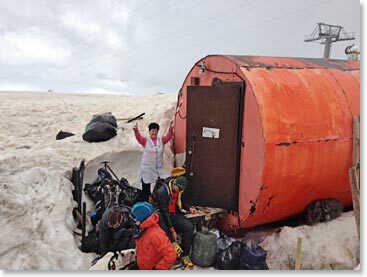 It’s a real landmark for us on the south side of Elbrus. This was sort of a gauge to see how we are feeling and I have to say this team did very well. We climbed up there in a few hours today. We’ve got great snow conditions. The ski teams that are still training here and the climbers and athletes who are skiing and snowboarding are still loving the conditions this early July on Elbrus because we have so much snow. For us it’s good too because we have had some relatively low temperatures so the snow is firm. We started right out from our barrel waring our crampons today. It was good training. We used our ice axes as we climbed up right to the top of Pashtukov. 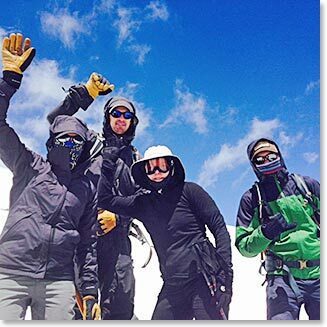 We enjoyed great mountaineering conditions. It’s not perfectly clear. It’s a bit unstable. There is some wind but all in all it’s good conditions on Elbrus. I think it’s going to hold for us for a few days as we continue to acclimatize. We return to the barrel and Leila, who is cooking for us again this year, had a nice soup and salad spread waiting for us for our mid-afternoon snack. We are going to sit back and enjoy the afternoon and evening. Tomorrow we will do some more training, get some of our gear ready, and rig our harnesses. We will see how the weather holds and how we feel as we get closer to our Elbrus summit attempt. Our cook, Leila, welcomes us to our Barrel.